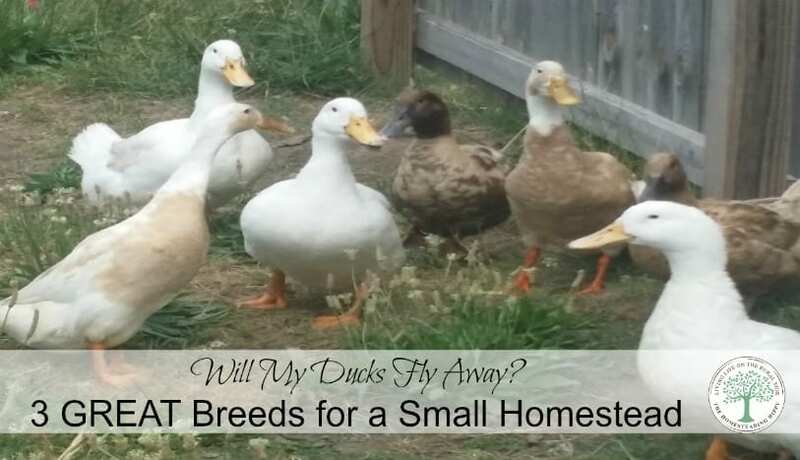 What Breed Of Ducks Are Best For A Small Homestead? Growing up, my father raised chickens and ducks. He has very vivid memories of his ducks one day upon hearing wild ducks quacking in the sky, taking off and flying away, never to be seen again. I was always worried that would happen to me as well. But, I got to know a bit more about different breeds of ducks and their ability to fly. There ARE some breeds that will fly, and fly away if necessary. Muscovys and Mallards are 2 breeds that can fly. Muscovys like to “roost” in trees, and Mallards are small enough that they can take off at a moment’s notice. It would be heartbreaking for the small homestead to own either of these breeds, and then go out to feed them one day only to have them disappear. If you have a larger homestead with lots of room, Muscovys would be a great breed as they eat lots and lots of mosquitoes. Their ability to fly will help protect them from predators, and they usually will stick close to home anyway. If you choose Mallards due to their gorgeous color, you may want to consider a closed off area for them to live, where they can’t fly away. 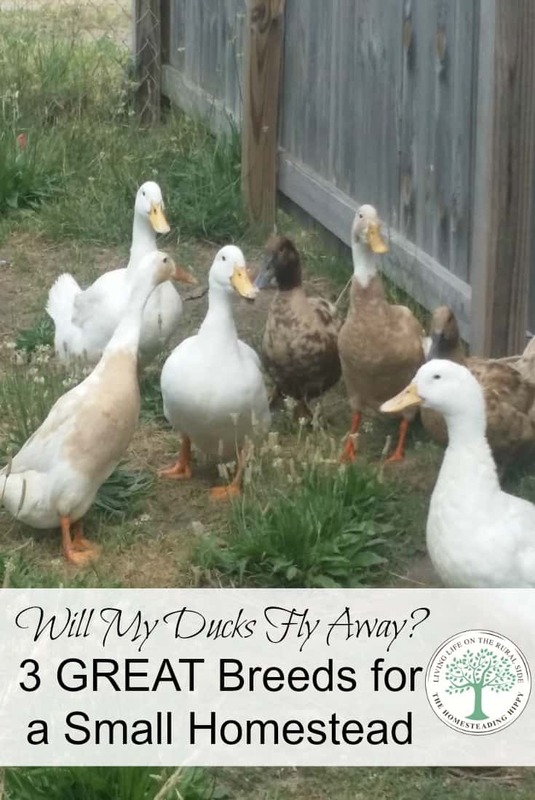 Other breeds of ducks that are great for a small homestead are Pekin, Indian Runner or Khaki Campbell. These ducks, due to their body build are unable to fly away. but I have personally found them to be excellent layers as well. We have one that is going on 6 years old and is still laying 5 eggs a week. their body weight is what keeps them unable to fly more than 5-6 inches at at a time. They are pretty happy ducks, and quite friendly, but can be a bit on the noisy side. Indian Runners are quirky little ducks, that walk more upright than other breeds. Their body length and small wings are what seem to keep them from being able to fly away. But, boy, can they run! Let one of them get loose and good luck chasing it down if it’s far ahead of you. The best thing, is that ours seem to like to stay close together, and if one gets out, it’ll work it’s way to getting back to the rest of the flock. They are a talkative breed and a bit more skittish, but are great layers and easy to care for. Khaki Campell ducks are another breed that won’t fly away. They have gorgeous feathering and are pretty sweet. For all the breeds I’ve owned, they are the most quiet of the bunch, and the very friendly. They are pretty calm and happy as long as they have plenty of water and they are great layers, laying 6 eggs a week consistently. So, yes ducks can and will fly. Some of them. There are plenty of breeds to choose from to raise on a smaller homestead that won’t break your heart, too! Grab a couple ducklings and get quacking! Another breed to add is the Saxony, they are a great multipurpose breed that lays really well but gets to the size range of a pekin for meat. Basically, don’t get as large as quickly as a pekin (usually a pound lighter) but lay really well and are excellent foragers. I love em, they eat just about everything, as long as its safe for ducks to eat, they eat it. they ARE a beautiful breed as well! Thanks for adding them! Swedish blue ducks are on my “to get” list for next Spring again! We loved them before! when i purchased my ducks i got 1 black indian runner, 2 khaki and a peking. one khaki died at a week old and our peking got attacked by a dog. 🙁 our other khaki is ill and doesn’t lay eggs but my indian runner started laying the first of this year and has only missed laying an egg about 5 days total! amazing layer! i just purchased 4 more ducklings that arrived today i bought 2 black and white magpies, a black runner and a fawn and white runner. unfortunately our black runner died shortly after arriving! boo! oh no! I am so sorry, it’s never easy to deal with loss, no matter what it is! Another great breed is the Rouen. No one in my family ever developed a taste for duck eggs, so I’ve mainly raised dual purpose breeds. Although I have raised Indian runners because I think they are cool. The Rouen gets the same size as a Pekin, has delicious meat (probably because it is slower growing), and they are pretty, like a mallard but somewhat darker and richer colors. I also like the Swedish. If you want a breed that will truly take care of itself and hatch and raise plenty of ducklings naturally and all on its own, you can’t beat the mallard. Yes, they can fly, but the Ridgeway Hatchery strain anyway behaves much like a domestic duck. The instinct to migrate has been bred out of them. I keep my birds in a pen with a top most of the time because of hawks, so flying isn’t an issue. Not even a duck that can fly can escape a hawk. In principle ducks can indeed feed themselves by foraging, in actual practice however, they are defenseless against predators. Don’t count on being able to turn your ducks out during the day so that they can feed themselves. You’ll lose them to predators, especially hawks and dogs.